Inspired by the beauty of molten lava, these handmade guitar picks fuse glasswork and music. 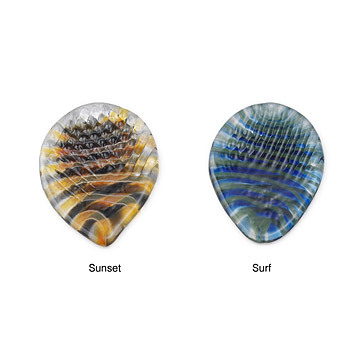 Inspired by the beauty of molten lava and its similarity to glass, these luminous guitar picks by Hawaiian artist Rosemary Pierro bring the rhythm of glasswork to music. Rare and exceptional at producing a harder, metallic sound, the Ridged Glass Guitar Pick works with all guitar strings and is sturdy enough to withstand different musical styles. Each individually-torched borosilicate pick features easy-to-grip texture for turning your jam session into a work of art. Handmade by Rosemary Pierro in Hawaii. Choose from "Sunset" (left) or "Surf" (right), (right). Rosemary Pierro spends a lot of time outdoors in her native Hawaii. Working with hot glass touches on the Hawaii's natural beauty of lava flowing and the ocean's movements. Her favorite part of the glass-working process is that moment, after an idea is all planned out and then you sit down at the torch and see what the flame has to say. You can only impose so many ideas onto how the fire will melt and move the glass. In truth, a good artist always works with the glass. Glass artists always wonder what to do with the leftover bits of glass. This is Rosemary's best idea yet. The guitar picks are no longer made from unused pieces. To ensure durability and sound quality, she now uses only first quality borosilicate glass. But, the idea started with the pretty little pieces of glass laying around her studio. Sunset is made of caramel and black onyx in equal parts. Surf is made of cobalt blue and deep jade green in equal parts. Sand is made of butterscotch, jade green, and moss green sparkle. The pick broke but they rapidly replaced it and he's had no difficulty with it since. My husband was skeptical at first about using a "glass" pick, but he now appreciates how comfortable they are to use and the unique sound they produce. They are treasures. My friend loves guitar, and so do I. I saw these and thought that they would be a perfect gift because he has nothing like this. However, when I got these in, they were much larger and more circular than expected. This makes them hard to play with, and overall, it doesn't produce a great sound. Also, from a visual standpoint, it doesn't look at all like pictured and the colors are more faded than they seem. I bought this for my husband but it's practically unusable. He's played guitar for years and is an experienced player. He says the pick is rather thick for guitar, pulls at the strings and makes an odd sound. We were both very disappointed. It is a unique gift for a guitar player. I ordered the blue. The color is a bit muted, but still nice. I wish it had come in a small gift box. All around excellent piece for a guitar enthusiast. It's also very pretty.